Goodreads Summary: Quitting her husband’s house and moving back in with her horrible family, Lady Maccon becomes the scandal of the London season. I am so enjoying this series! I really liked Blameless, and things got interesting in this book! Alexia being pregnant with Lord Maccon’s child is quite scandalous, as werewolves do not have the ability to have children…which means it would appear that the child is not Lord Maccon’s. But Alexia and a select few know that she did nothing scandalous at all. But as most everyone believes differently, Alexia travels to Italy to find out the answers she is looking for. Namely, how one can have a child with a werewolf. Conall and Alexia are separated for almost the entire book, but I do like that we see Alexia’s adventures and Conall dealing with banishing Alexia from his home. He did, in the end, realize he was acting like a complete idiot, and he and Alexia did make up by the end of the book. She did, I suppose, forgive him a bit too easily, and the entire situation in France and Italy could have been (mostly) avoided had she insisted she didn’t do anything wrong and had he not acted like an idiot. Still, given the times, I kind of understand why he had her leave. So…Alexia’s unborn inconvenience. I like that she and her friends were trying to figure out what happened, and what her child could be. We do get an answer with the help of a German scientist, who kept referring to Alexia as his female specimen. The way he said it was hilarious, but it did get a little trying by the end of the book. Still, since her child is the result of someone who is soulless, and someone who is a werewolf, it’ll be interesting to see if Alexia is repelled by her child (if indeed her child is a preternatural) or if her child will take on other supernatural qualities that no one can foresee. Since it’s pretty rare and all. There were quite a few times when I could not stop laughing! Alexia is hysterical, and she is such an interesting character! Not only is she funny but she is not one to mess with, because she’s smart and witty and pretty quick on her feet. And I liked how she had the support of her friends while traveling through France and Italy, and that Conall saw the errors of his ways and came through for Alexia in the end. Emily Gray is such a great narrator! She does so well with the different accents, and she really does bring Alexia to life! I can’t imagine anyone else narrating the series. 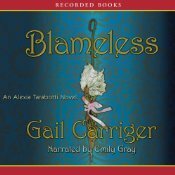 I really enjoyed Blameless, and it was such a fun book to listen to! It’s hard not to laugh at Alexia sometimes, but she’s a great character, and I can’t wait to see what’s in store for her and Conall now that she’s pregnant. I didn’t completely love Blameless, and I did miss Alexia and Conall together, but Blameless is still a great book! Blameless gets 4 stars.